Despite the continual frigid temperatures, we know that spring is just around the corner. For tunnel growers, spring comes even a little bit earlier than it does in the field. We are starting some of our transplants now (tomatoes and peppers for April 1st, and 15th plantings) and will do some bed prep later in the month of February. While this site is dedicated to our tunnels, we thought we might feature a little information about another technology we grow in: a "solar greenhouse" adapted from designs found globally. These greenhouses use water barrels or sand filled structures to trap heat throughout the day and then release that heat slowly overnight. It's still no active heating, but the passive solar capacity of the structure is increased. As you can see, we are going into that solar greenhouse VERY soon. We actually started some of our transplants back before Christmas. 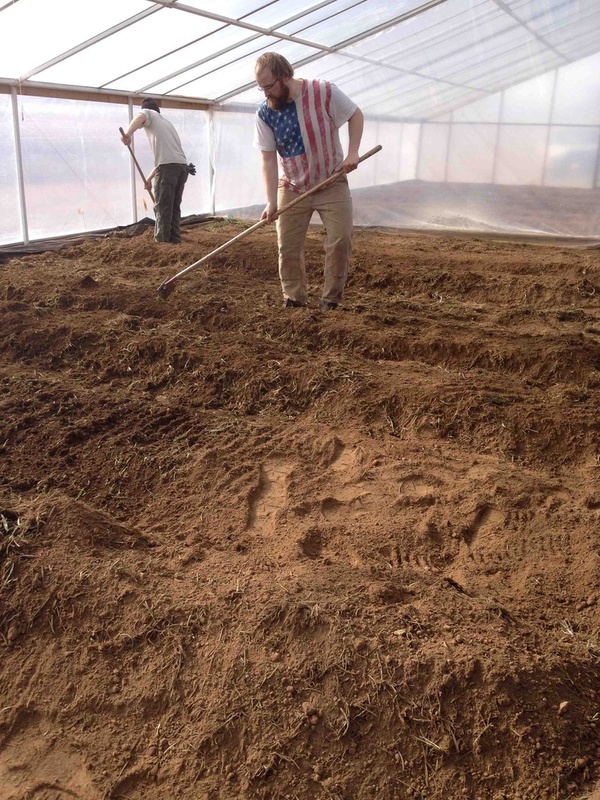 Since our planting date is coming up soon, we actually got out and worked ground in the solar greenhouse over the last few weeks. This picture was taken yesterday. It was hot enough inside that tunnel that we were sweating in short sleeves. It felt like June! 2. Let the residue sit for a week or so to begin breakdown. 5. Wait a few more weeks for more breakdown. 6. Final bed prep/fertilizer application. All the while, we will be promoting breakdown by applying water. We lay drip tape first and then cover the ground with landscape fabric to suppress weeds. This landscape fabric has holes burned in it big enough to plant the tomatoes into. It's pretty a strange feeling to be making beds like this in January, but we want to see how far we can push this season extension thing!